We have compiled a series of questions and answers to help our residents with our recycling drop-off program. Can you give me more information about the new recycling drop-off? 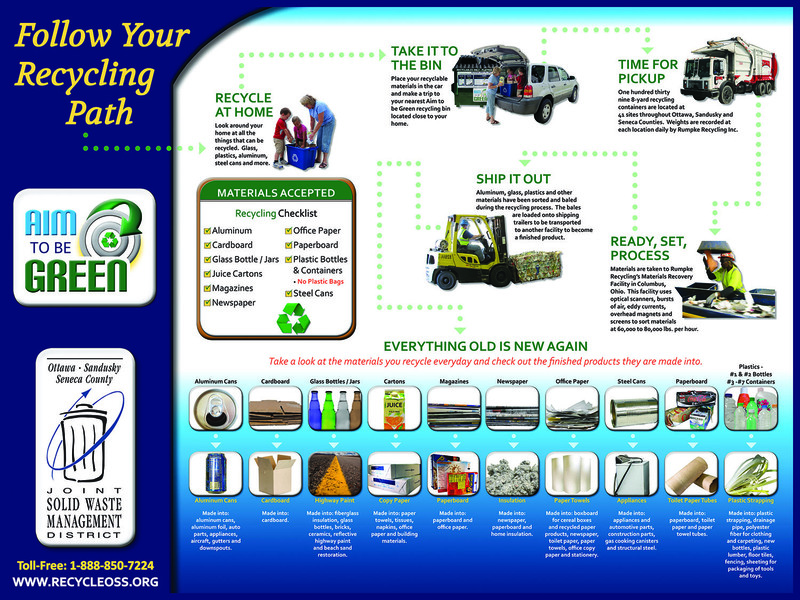 The Aim to be Green Recycling Drop-off Program began October 1, 2012. There are 182 eight-yard recycling containers located at 41 sites throughout Ottawa, Sandusky and Seneca Counties. The recycling drop-off programs are more efficient, cost effective and offer identical services across the District to better serve our residents. Where are the drop-off sites located? When can I drop-off my recyclable materials? Residents can drop off their recyclable materials at their convenience. The recycle bins are available 7 days a week during daylight hours only. What materials are accepted in the recycle bins and do they need to be separated? Aluminum Click here to see the steps for preparing materials. The recycle bins are smaller now than they used to be. Does this mean less is being recycled? No. To maintain a successful program, the recycle bins are emptied 1-3 times per week depending upon how much they are used. For example: Three recycle bins serviced twice weekly is the equivalent of 1-1/2 standard 30-yard roll-off boxes. How do I get my recyclable materials into the recycle bin properly? There are 3 options to access the recycle bin. lids. If you flip a lid open, please remember to close the lid. This will prevent loose materials from blowing out of the bin. place recyclable materials inside. If you slide a door open, please remember to close the door. small openings located on the lids or the sliding doors located on each side of the recycle bin. Plastic food, beverage and detergent containers are accepted for recycling. The sign on your recycle bins say #1 & #2 Plastics & #3 - #7 Containers. What does this mean? Plastic food, beverage and detergent containers are accepted for recycling. Examples of plastic bottles and containers falling into this category include (but are not limited to) plastic food & deli trays (plastic clam shell containers), detergent containers, milk jugs, water/pop bottles, shampoo bottles, yogurt containers, etc. Plastic materials that DO NOT BELONG in the recycling bins include items such as plastic bags, ALL polystyrene and Styrofoam items, automotive or chemical containers, packaging materials (packaging peanuts, plastic wrap, EPS block packaging, etc. ), laundry baskets, buckets, garden hoses, plant trays, PVC materials, toys, Tupperware and vinyl siding. This listing is not all inclusive, however, materials listed are the more common materials we see in the recycle bins that DO NOT BELONG. If you ever question whether a plastic item can be placed in the recycling bin or not, give us a call. When in doubt, call the District office at 419-334-7222 or call toll-free at 1-888-850-7224. Can I use a plastic bag to contain my loose recyclable materials (e.g. - office paper, newspaper, or magazines)? Plastic bags should not be placed into the recycle bin. Residents can contain loose paper materials in paper grocery sacs or reusable plastic bins. Can plastic bags go into the Aim to be Green recycle bins? Plastic bags should not be placed into the recycle bin. See below if you would like a listing of local businesses accepting plastic grocery bags for recycling. Can Styrofoam or polystyrene (i.e. - Syrofoam egg cartons) be recycled in the Aim to be Green recycle bins? A butter tub is a plastic food container, why isn't it accepted for recycling? The grease and oil residue left inside an empty plastic container is considered contamination. However, the plastic butter tub (and other plastic containers containing similar contaminants) can be recycled ONLY if the remaining residue is completely rinsed out and has been thoroughly cleaned. I used to separate my recyclable materials before dropping them off. Now, I put all of my recyclable materials into the bin all together. Won't all of the material be contaminated? process the materials. These methods include mechanical sorting, optical scanners, bursts of air, eddy currents, overhead magnets, sorting screens, etc. I have heard or have seen the term contamination. What does it mean when the phrase "contaminated materials" is being used? 1) Materials that are NOT ACCEPTED in the recycling program. This includes plastic bags (of any type), styrofoam, laundry baskets, window glass, dishes, etc. 2) A pizza box is made of corrugated cardboard, a recyclable material. However, the pizza box is considered a contaminated material if the grease and food residue from the pizza remain in the box. 3) Peanut butter is typically contained in a #1 or #2 plastic jar, a recyclable material. The plastic jar is a contaminated material when the oils and sticky food residue remain in the empty peanut butter jar. Once the contamination is thoroughly rinsed and completely removed from the jar, it can then be recycled. Who is responsible for emptying the recycle bins? Service is provided by Republic Services. The material is collected and taken to their Materials Recovery Facility (MRF) located in Oberlin, Ohio and Erie, Michigan. The facilities use single stream recycling to sort materials. How are you able to record the weight of the materials being recycled? Material weights are captured as the truck drives across a large scale before unloading material at the recycling facility. Who is in charge of maintaining the recycling drop-off site? District staff is responsible for the maintenance of the 8 yard recycling containers. However, Township Trustees and their maintenance staff assist the District by removing snow around the recycle bins and other issues regarding maintaining the recycling drop-off site. Who is responsible for paying to service the recycle bins? The OSS Solid Waste District pays for servicing all Aim to be Green recycle bins across the District. Landfills are charged fees for each ton of waste they accept. This is how the service is funded.